Right now, somewhere in this country, nursing home caregivers are quietly committing abuses. Right now, their nursing home owners are making excuses. Right now, a nursing home patient who is unable to communicate wants desperately to tell someone that she has been violently assaulted by a caregiver, but can’t. Right now, a U.S. military veteran who faithfully served his country is being neglected by a nursing home that promised him better. Right now, a desperate patient is developing painful and life-threatening pressure sores because a nursing home has insufficient staff to help him reposition. Right now, a nursing home employee who earns far too little is spending her own money to buy food and supplies for her patients because her employer won’t. Right now, nursing home corporations are enjoying record profits with no limits in sight. Yet, right now, families are grieving the loss of loved ones who suffered and died from nursing home neglect and abuse while nursing home staff falsify medical records to conceal their wrongdoing. Chances are, you’re here because you or a loved one has suffered —or is at risk of suffering —nursing home neglect or abuse. You want to do something, but perhaps you fear retaliation, you think it is hopeless, or perhaps you simply don’t know where to begin. Armed with the tools and strategies you’ll learn in Abuses and Excuses, you can take steps immediately to help any patient get the care he or she was promised, and to find the answers and accountability that they deserve. The reality is that a nursing home is a business, that someone is profiting from that business, and that, unfortunately, profit is generally the priority of those who own and manage the facility. The nursing home industry thrives by putting profits before people —the vulnerable patients they’re charged with protecting and caring for. This relentless drive to increase profits at the expense of patients influences every aspect of a patient’s daily care, resulting in, for example, dangerously understaffed facilities with employees who are poorly screened, poorly trained, poorly supervised and poorly paid. In Abuses and Excuses, you’ll learn how to take a series of steps that send a powerful message that this isn’t acceptable for your loved one or anyone else’s. If you’ve ever had to confront nursing home staff about your suspicions of neglect or abuse, you’ve likely encountered the industry culture of coverup. 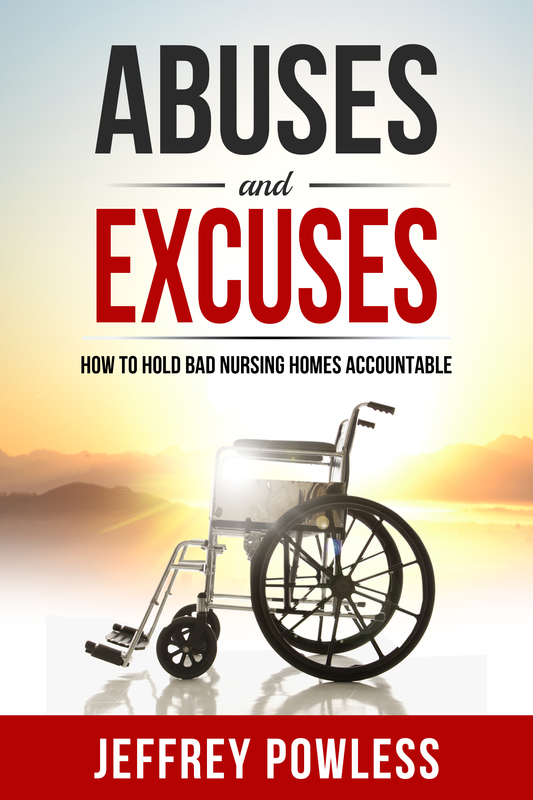 Nursing home facilities often ignore or strategically conceal evidence of abuse and neglect in order to avoid regulatory scrutiny of their operations, negative publicity and, of course, liability. They may resort to blaming patients, blaming families, and offering excuse after excuse in an effort to deflect responsibility for the harm that results from their financial greed and misconduct. And they do it all while turning a blind eye toward the inevitable and foreseeable harm to the patients they’re being paid to properly care for. Abuses and Excuses reveals specific strategies for battling the culture of coverup, to help you find answers and accountability. You’re probably not exploring Abuses and Excuses because you imagine that you alone can transform the entire industry. Perhaps, right now, your greatest concern is learning how to protect a loved one from neglect and abuse. You can —and should—do that. But make no mistake, in helping your own, you help others. Taking even the smallest steps to hold a nursing home accountable helps improve care not only for your loved one, but also for others in your community, and in communities like yours all across the country. It’s no secret that the nursing home industry has a troubled history. 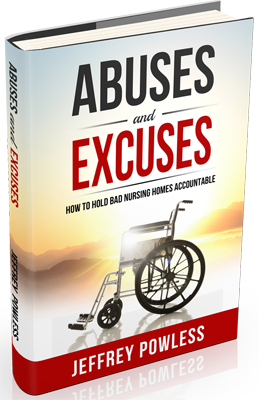 Abuses and Excuses reveals the firsthand knowledge, experiences, and insights of an attorney who has spent years in the trenches investigating and prosecuting nursing home neglect and abuse. You’ll learn what really goes on behind the scenes in nursing homes and how to deal with the powerful forces that conspire to create a perfect storm of life-threatening risk for vulnerable patients. You’ll hear firsthand stories and testimony from patients, families, physicians, frustrated nursing staff, state investigators and other industry professionals that will inspire and empower you. You’ll learn how to identify troubled facilities and spot the early warning signs of neglect and abuse. And you’ll become educated about the rights and remedies that can help protect patients from becoming victims. What can I do to improve the quality of nursing home care my loved one receives? How do I know if my loved one has been neglected or abused? What legal rights does a patient have if he/she is neglected or abused? What steps should I take if I suspect neglect or abuse? How can I tell which nursing homes are good and which are bad before admittance? How do I obtain patient medical records quickly, and at low-cost or no cost? How do I get a complaint investigated by state investigators and/or patient advocates? How do I know if I can or should pursue a civil lawsuit against a nursing home? Should I notify law enforcement about suspected abuse or neglect? Abuses and Excuses will empower you to take the critical steps to ensure that you get the answers and accountability you deserve.